While walking their dogs in Orme Park recently, Paige Cucchi and her husband Sean saw something you don’t see every day: a snapping turtle laying her eggs in the middle of the walking path on the park’s northeastern edge (across from 818 Brookridge). The Cucchi’s placed some sticks and warning tape around the nest to protect it from being trampled by other walkers, then notified the VHCA. 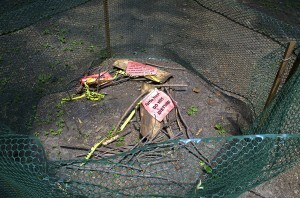 Volunteers rushed over and put up temporary plastic fencing to better protect the nest until the eggs hatch in late July or early August. When the eggs hatch, the young turtles will most likely try to make their way to the nearby creek. During this time the young turtles will be very vulnerable to predators, including unleashed dogs. 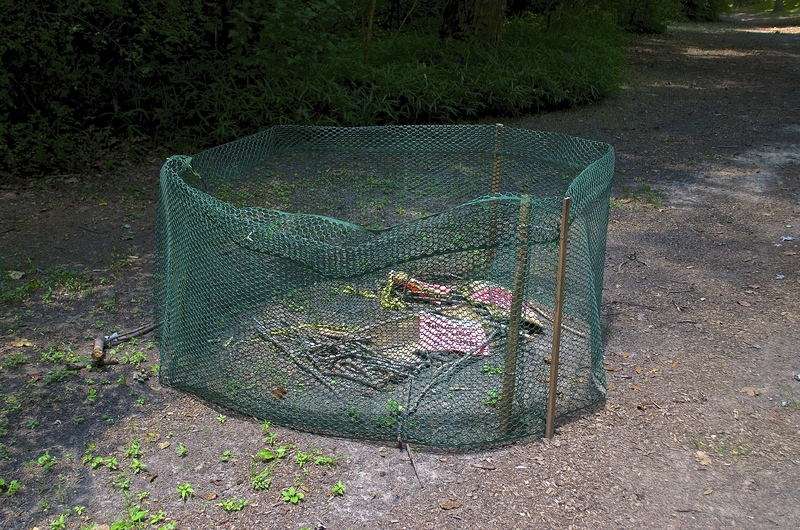 As the time for the eggs to hatch draws nearer, we will cut a hole in the fencing so the turtles can escape and erect additional fencing to protect and guide the turtles as they make their way to the creek. Please do not disturb the nest or the fencing and ask your friends and neighbors to do the same. If there are any residents who’d like to help discourage vandalism and increase the turtles’ survival chances by forming a watch committee, please let us know at parks@vahi.org. Might be something fun and interesting for the kids to do during the long, hot summer. 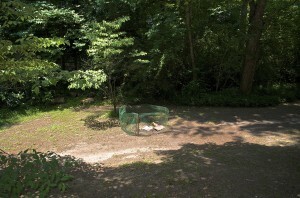 This entry was posted in news and tagged 2014, ormepark, turtleeggs by John Becker. Bookmark the permalink.